•	French cosmetic brand wanted to create a more immersive experience and grow its audience around the world. Birchbox is the brainchild of friends Katia and Hayley, who wanted to create a better way for people to find, try out and shop for beauty products online. Delivering products straight to its customers via a subscription model, Birchbox. The brand wanted to experiment with Canvas ads in Instagram Stories to create a more immersive experience for its existing audience in France and also grow its audience around the world. Birchbox needed to combine two different messages in its campaign—one focusing on brand awareness, and another highlighting a promotional offer. To accommodate these dual messages and give its audience a seamless and immersive viewing experience, it decided to use Canvas ads in Instagram Stories. The Canvas format allowed Birchbox to create engaging eye-catching video that showcased the brand and what it stands for, along with examples of the products available. Canvas ads in Stories also made it easy for people to click through to the Birchbox website to find out more about the special promotion and move them towards purchase. •	Now has over one million subscribers and over 80 partner brands. The decision to experiment with Canvas ads in Instagram Stories proved a success for Birchbox and delivered strong results, including a 50% lower CPM (cost per mille) compared to other platforms, and a 4X higher click-through rate to the website. 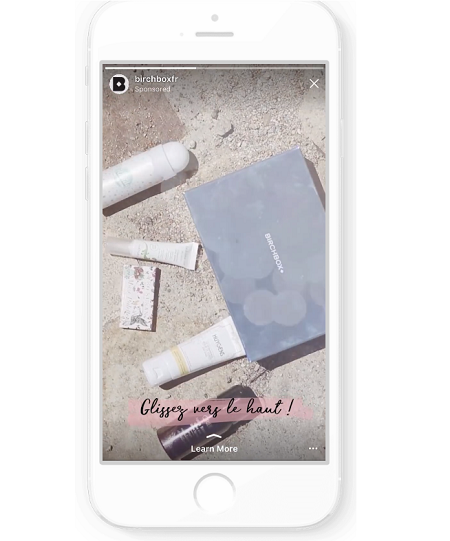 Julianne Clamens, Senior Content and Social Manager, Birchbox France, said: “We were very proud to try this new and exciting ad format. The results of this first campaign open promising prospects for the future.